The original article can be found online at https://doi.org/10.1007/s10884-018-9694-7. 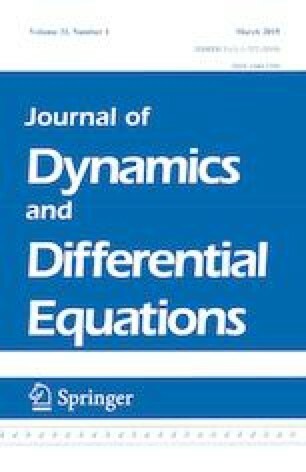 The article Pinned Solutions in a Heterogeneous Three-Component FitzHugh–Nagumo Model, written by Peter van Heijster, Chao-Nien Chen, Yasumasa Nishiura and Takashi Teramoto, was originally published electronically on the publisher’s internet portal (currently SpringerLink) on August 11, 2018, without open access. With the author(s)’ decision to opt for Open Choice, the copyright of the article changed on September 10, 2018, to © The Author(s) 2018 and the article is forthwith distributed under the terms of the Creative Commons Attribution 4.0 International License (http://creativecommons.org/licenses/by/4.0/), which permits use, duplication, adaptation, distribution and reproduction in any medium or format, as long as you give appropriate credit to the original author(s) and the source, provide a link to the Creative Commons License and indicate if changes were made.